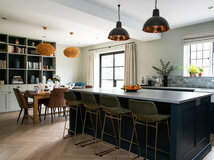 Where bold colour is concerned, many of us love the idea in principle, but revert to safer neutrals when it comes to the crunch. 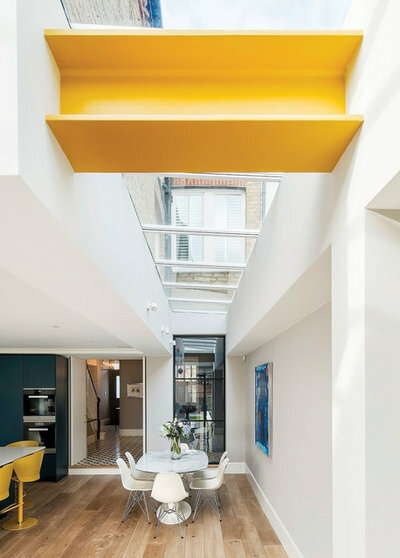 This cheerful family home, though, shows how colour can transform a space. 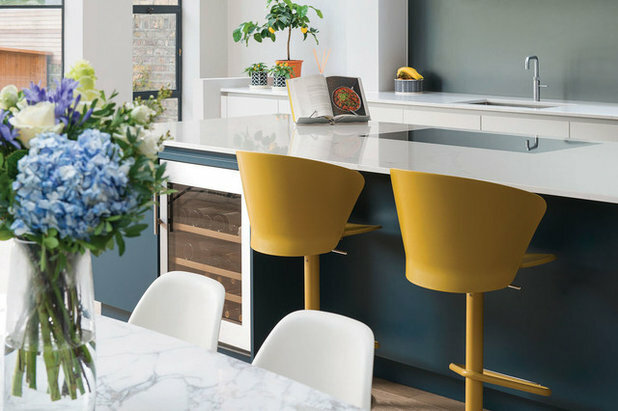 A light, bright kitchen, featuring splashes of bold yellow teamed with a rich dark blue, is modern and uplifting. 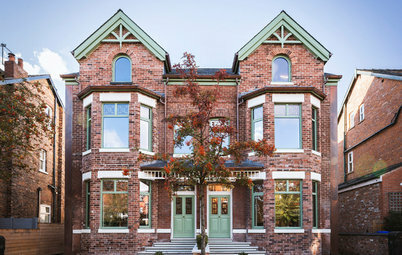 “We wanted to create something that was a statement and reflected the owners’ personalities,” says interior designer Cinzia Moretti of Moretti Interior Design. 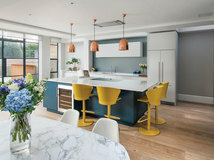 The kitchen in this refurbished family home was already in place when Cinzia was brought on board. 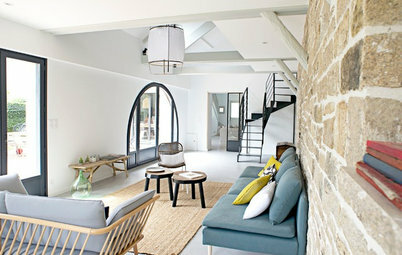 (The house had recently been extended at the side, and the basement and loft converted.) 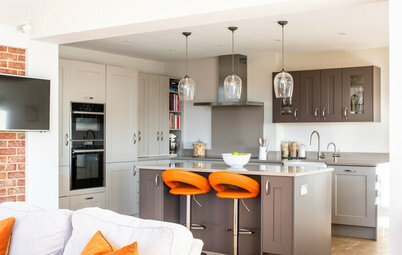 However, she helped to decide the final colour scheme, including cabinet paint finishes and worktop material. 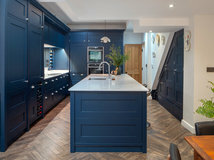 Cabinets painted in Hague Blue, Farrow & Ball. 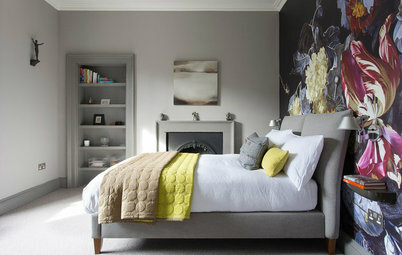 Walls painted in French Grey Mid, Little Greene. Bar stools from a trade supplier. 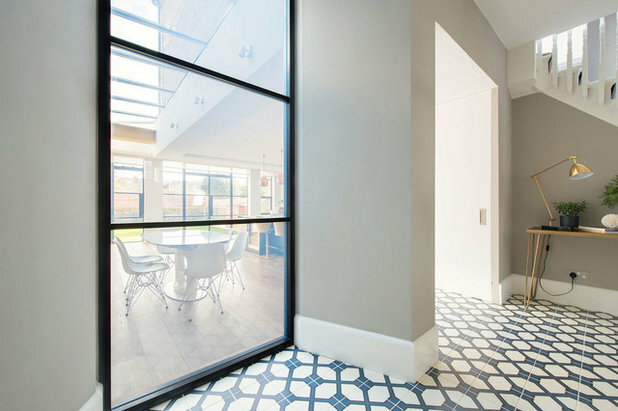 The dark blue island and black-framed Crittall windows help to ground this big, bright space. “The kitchen is quite minimal, but it doesn’t feel cold, thanks to the heritage shades,” Cinzia says. They chose a dazzling white, super-slim marble worktop that’s been treated so it won’t stain. 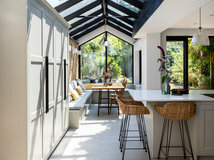 The dining table has a similar top, and was made bespoke to suit the space. The flooring in here is an engineered grey oak, which extends across the whole ground floor, apart from the hallway. 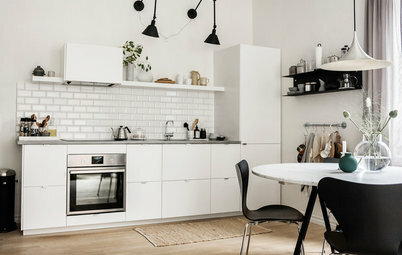 White Eames Eiffel chairs, Vitra. Kitchen units, Roundhouse. 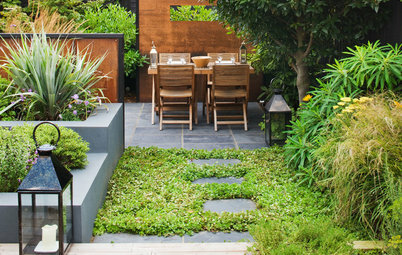 The owners love cooking and entertaining, so the roomy dining zone is perfect. 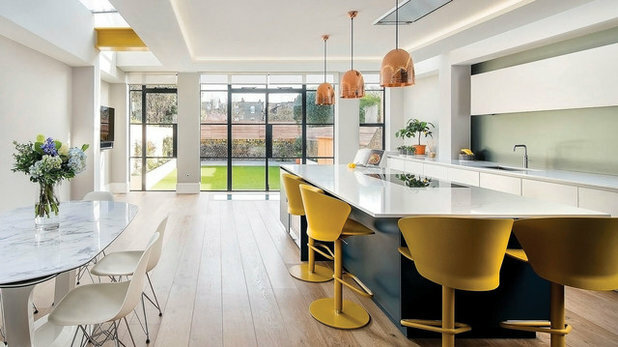 A golden beam carries the colour theme into the dining area. “Originally, this was black, but painting it yellow has turned it into a real feature,” Cinzia says. Saturno crystal pendant light, Baroncelli. Floor tiles, Fired Earth. 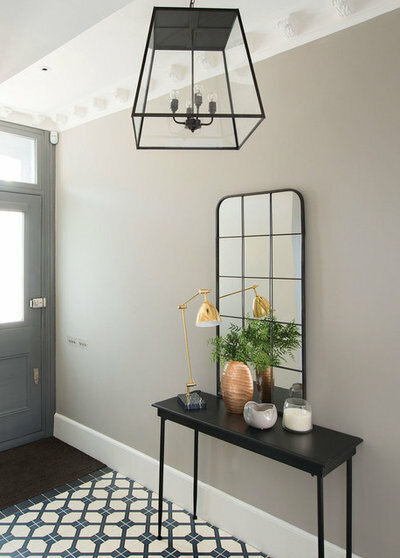 Gold and copper metallic accessories add some subtle glamour. 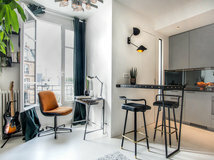 Read reviews of interior designers in your neighbourhood. 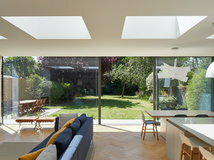 Internal windows, skylights and over-sized doorways let the light flow through into the hallway from the adjoining spaces and really open up this area. The living room’s design began with the owners’ Eames leather lounge chair, an iconic midcentury piece. 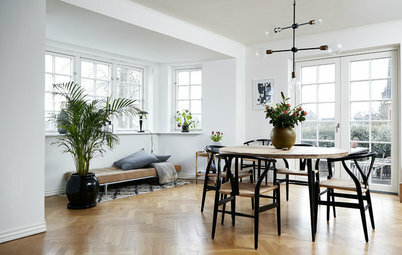 “Her style is more Nordic, his is more modern, so we tried to blend both together in here,” Cinzia says. 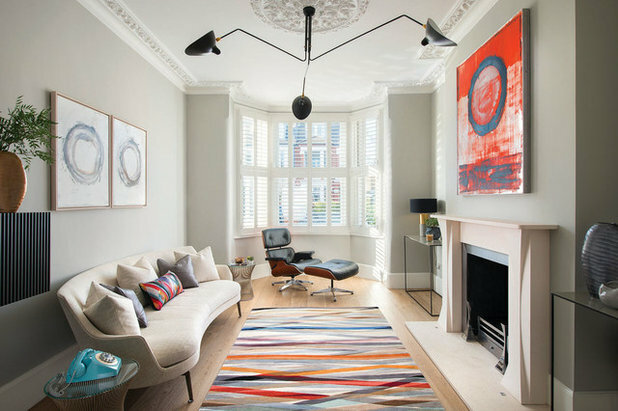 A bold rug and large artwork add colour to a largely neutral backdrop, while the curvy sofa is minimal but soft. Rug, The Rug Company. Sofa, Flexform. Astrom ceiling light, Serge Mouille. 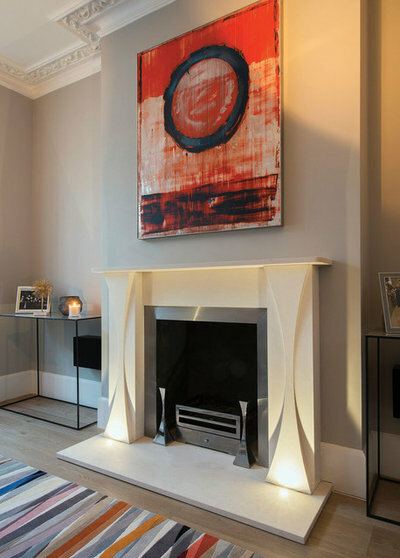 The fireplace is reminiscent of origami. “It echoes the shape of the pedestal table in the hallway,” Cinzia says. 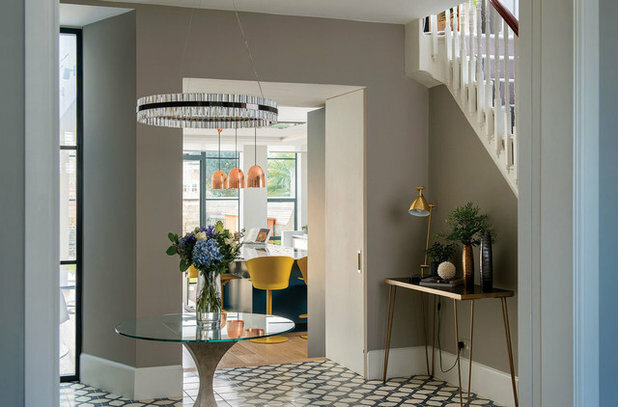 ‘Luxury meets simplicity with a dash of midcentury chic’ is the vibe in the living room. 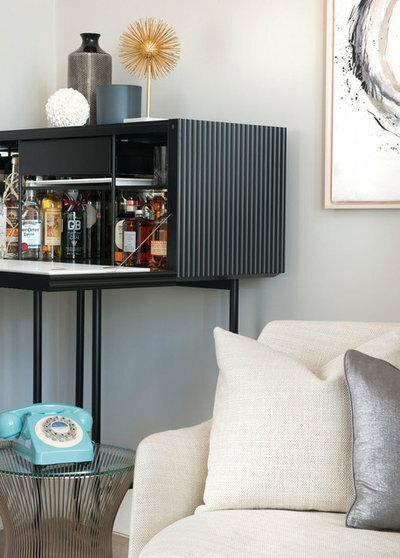 The stylish drinks cabinet was made bespoke and fits right in. The couple already owned a fair few pieces of furniture, including the wirework table; Cinzia added the phone for a retro touch. 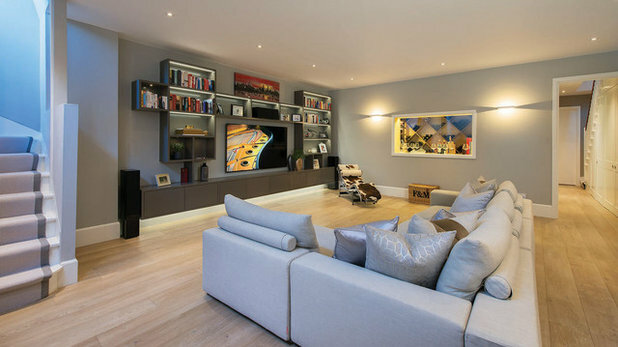 The basement room has a large corner sofa and a big TV for family film nights. The owners love a fine wine. 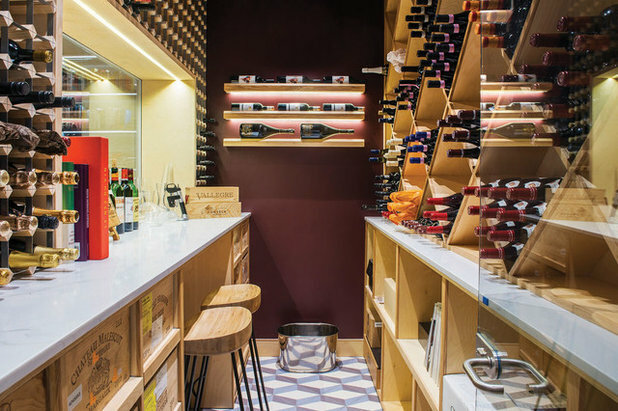 “In the cellar, the wall colour was picked to resemble a tavern, as well as the wine itself,” Cinzia says. Walls painted in Brinjal, Farrow & Ball. 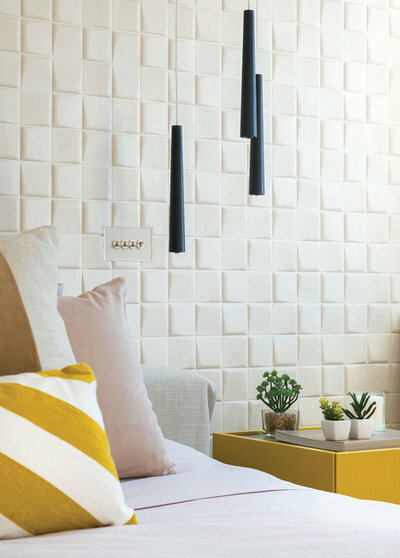 In the master bedroom, a wall of soft, 3D wallpaper with a suedette finish takes the place of a padded headboard. “The owners already had the bed, and it wasn’t possible to fit a headboard to it. As the room is big and bright, we also wanted to create a feature wall, so this was a great solution,” Cinzia explains. 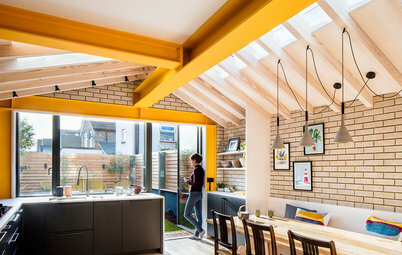 The yellows deliberately echo the sunny shades in the kitchen, “so there’s a flow through the house,” she says. Slim pendant lights help to create a boutique hotel atmosphere in the master bedroom, and the layered cushions add to the sense of comfort and luxury. 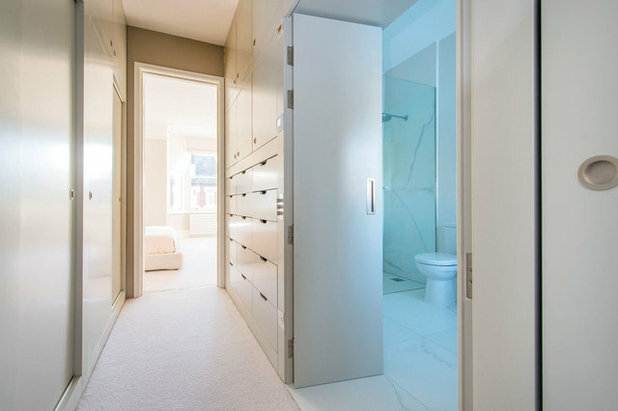 A streamlined walk-in wardrobe made of ply lines the corridor between the master bedroom and the en suite. 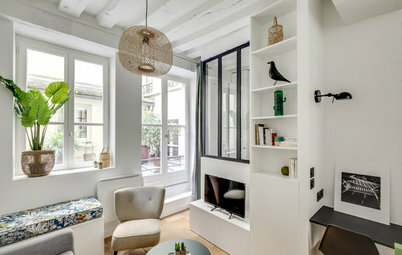 “As the space is quite narrow, we went for recessed handles,” Cinzia says. Soft blush shades give this second bedroom a calm, inviting feel. 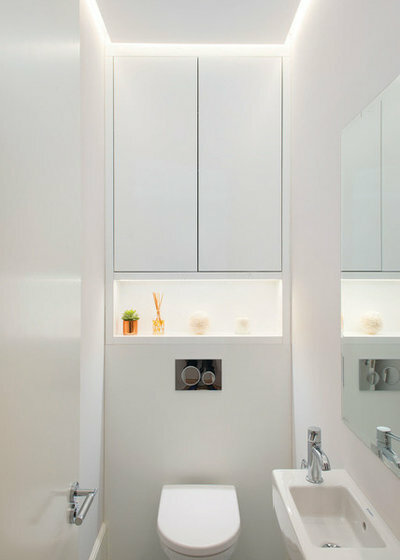 Bespoke cabinetry and concealed lighting make the most of the space in this small bathroom. 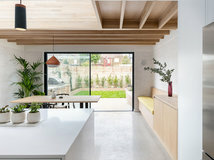 What do you like about this light-filled home? Share your thoughts in the Comments section. Cinzia is such a genius Interior Designer. I always like seeing her realisations. 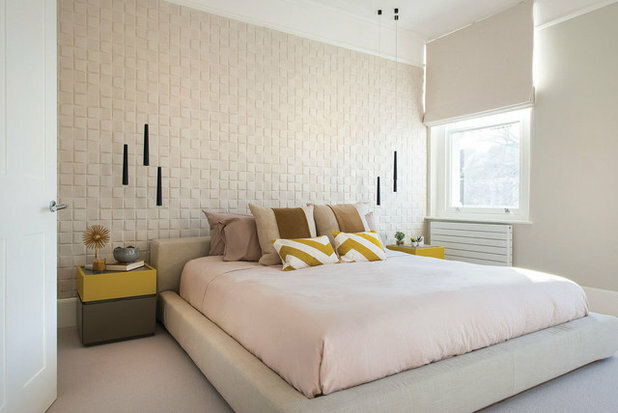 I particularly like the yellow painted beam and the featured wall as a headboard! I would love a floorplan too. 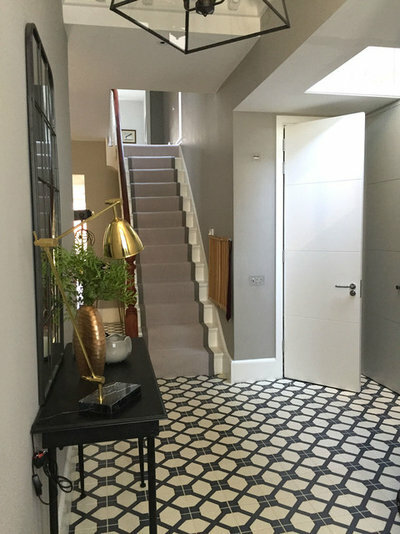 It looks as though the second reception (the one that usually becomes dark with these extensions) has been sacrificed in favour of a wider hallway and the stairs to the basement...? Brave! 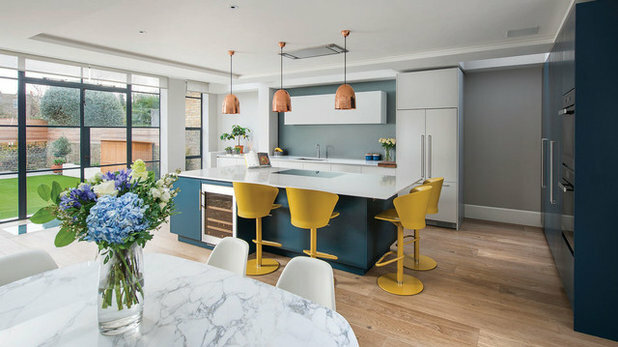 We absolutely love the balance of classic and modern, giving a gracious not to the architecture while adding a brilliant pop of colour and style!